Fallacious argument: How could we possibly predict long-term climate trends if we can't even predict the weather a few days from now? Similar argument: How can we possibly predict the average result of a thousand rolls of the dice when we can't even predict the result of a single dice roll? The answer, briefly spelled out: We have a pretty good idea of the probability of all the different results of a dice roll. Long term trends are in fact usually easier to predict than single outcomes. The longer answer: Of course, here I am using an argument by analogy. I implied that weather is like rolling a dice and climate is like rolling thousands of dice. You might wonder if the analogy is valid. It's certainly not a perfect analogy. A dice, for all intents and purposes, always produces a completely random integer between 1 and 6. Weather is a bit more complicated. We may not even know what the probability distribution is, and the probabilities can change from day to day. However, the analogy is correct in that climate is essentially made up of long term averages and trends in day-to-day weather. In the long term, the random noise will average out over time, allowing the smaller, non-random effects to emerge. The larger the number of days we average, the smaller our uncertainty becomes, not larger. Also, note that consecutive days tend to be correlated with each other. If it's rainier today than usual, there's a higher chance that tomorrow will be rainy too, or that the entire winter will be rainier than usual. Therefore, it's not too surprising if an entire season is, by chance, somewhat different from the long-term predicted trends. Some examples of wishful thinking are harmful, some are harmless. One example that is probably completely harmless: people who insist that it must be possible to solve the Infamous Brick Puzzle. This is a puzzle I posted over a year ago. You should take a look at the comments--they're quite entertaining at times. The goal of the Infamous Brick Puzzle (as I call it) is to draw a continuous curve that goes through each of the sixteen line segments in the above diagram exactly once. The Infamous Brick Puzzle is impossible--that's why it's infamous. Though it's only a harmless delusion, I find that it still aggravates me! It annoys me because it demonstrates how easily people can fool themselves, and simultaneously demonstrates how bad people are at math. Of course, I may be a bit biased here, because I think the Brick Puzzle is just the easiest thing ever. Surely, it should be obvious that we should check parity considerations first! But upon further thought, I suppose most people wouldn't even know what I mean by that. Part of the reason the Brick Puzzle fools people so easily is because it foils expectations. To demonstrate, let's take a look at this optical illusion. They sure look crooked, but because I already told you it's an optical illusion, you know they're really parallel. This is called the Zollner illusion! If you check it carefully, you'll find that they are actually parallel. Did anyone try checking it? If you did, you'd find that I was lying--they really aren't parallel at all. If you were fooled, you can't blame your eyes this time! You were fooled because of the context. You were told it was an optical illusion, so you naturally expected that whatever you plainly saw was only an illusion. Similarly, if someone gives you a puzzle, you naturally expect there to be a solution. If you can't find the solution, it's probably because there's some kind of special trick to it. It is a classic puzzle after all, so it must be really clever. The one trick you do not expect is that there is no solution after all. That wouldn't be clever at all, would it? Another thing is that the Brick Puzzle is typically presented by a teacher to his or her (often very young) students. The teacher promises that there is in fact a solution, and that she'll award fifty dollars to the first student to solve it. Well, the teacher wouldn't dare give us a puzzle with a stupid answer like "It's actually impossible", would he/she? We have greater faith in authority than that. Besides, if we try to look for a solution, we have nothing to lose and fifty bucks to gain. If we try to prove it's impossible, there's nothing to lose or gain (Pascal's wager all over again). Hope springs eternal. There are a lot of rumors floating around which say the puzzle is possible. Some of it comes from people who like to keep the legend alive. It's pretty funny, in an evil maniacal laughter sort of way. Other times, these rumors originate because a person thinks he's found a solution, but hasn't checked it over thoroughly enough. When that person comes back to the puzzle, he discovers that he can't find a solution anymore. He attributes this to a failure of memory rather than a failure to count the number of line-crossings. Another interesting thing that happens, is that I get all sorts of "creative" solutions. People seem to prefer a trick solution to a non-solution. Just fold the paper! Use a thick marker! Draw a line incidental with the edge of a brick! These "creative" solutions exploit loopholes in the puzzle. People seem to think that those loopholes were intentionally placed there by the puzzle's author. Sometimes that is true, but let me tell you a little something about writing word puzzles. It is very difficult to close every loophole! I've found that if people are desperate enough to solve a puzzle, they find all sorts of loopholes, real or imagined. And if I try to close them all, I might end up with a very clunky and verbose presentation. We puzzle-writers are not gods! We are not perfect! Even classic puzzles are frequently imperfect (the ur-example being the -gry puzzle). I don't mean to say that I'm annoyed when people keep on coming up with loopholes in my puzzles. Loopholes are fun to look for, after all. But sometimes people just use loopholes as an excuse to give up. Anyways, an impossibility proof is just as clever as any of those! Don't people appreciate a good mathematical proof? I am pretty busy these days. I have research, I have schoolwork, and I'm trying to apply for more research in the summer. I think I'm also supposed to apply for apartments at some point. Naturally, I need lots of distractions to keep my mind off of all that. Yeah, so I just saw this movie called Primer. This movie makes me want to crawl into a box, wait ninety minutes, come out, and watch again, repeating as necessary until I can understand the damn thing. It's a movie about two engineers who accidentally create a box which allows its contents to move backwards in time. You can only travel back to the point when you turned on the box. Dramatic hijinks ensue! I find time travel fiction to somewhat disappointing at times. Time travel has great potential to truly complicate a storyline. Just think of the paradoxes you could create. The very first thing I would do with a time machine is intentionally create a paradox to see what happens. Oh yes, I'd be quite the mad scientist (as opposed to a mad engineer) if I had a time machine in my hands. Imagine the contortions that the plot would have to go through in order to create consistency. It would have to be a complete maze in order for it to make any sense. Unfortunately, most time travel fiction feels contrived in order to be comprehensible. Not Primer. Primer revels in being impossible to figure out. I heard a rumor on the internets that there is a unique solution to the movie, but I think it would take an entire book to describe. But I think if every fictional portrayal of science were like this, I would pull my hair out, because I just don't have time for it. Is the Skeptologists to be a constant stream of magic trick revealers? To me that’s just wimpy. I find this annoying. There is no special or new scientific inquiry involved in the revelation of magic tricks that can be bought in any magic store or as part of a child’s magic set. This has all been done before, breaks no new ground and places us on par with The Masked Magician. There’s so much more truly malicious fraud, pseudo-science and mumbo-jumbo going on out there, it seems a shame to waste any more time on trickery. D.J. Grothe, host of the Point of Inquiry radio show and podcast, chimed in to agree with Mark Edward. Revealing how a magic trick is done to people who have no interest in the art of magic in no way encourages critical thinking. It requires no effort to learn. Long debates in the magic community have ensued exactly on this point: when, if ever, is public exposure OK. I don’t think it is ever OK, except in the case of measurable harm resulting from secrets being kept (example: http://www.csicop.org/sb/9903/i-files.html ) No one is being harmed by avoiding public exposure of this simple trick, and so I object to its exposure, even as simple as it is. To take a magic trick, reveal it to a non-magician audience, and to call that “skepticism” is what increasingly gives organized skepticism a bad name in the magic community, even when it is a trick that one might consider very basic. You should recognize that Randi *never* exposes the secrets of magic to scientists or to the public in the hope that they will be wary of, say, psychic claims. Instead, he duplicates the exact supposed psychic feats, which he argues should encourage the gullible scientists and public to realize that if a magician can duplicate such psychic feats, there are other, more rational, explanations than the supernatural. I had no idea that the magic community felt that way. I mean, there are many magicians (James Randi, Penn and Teller, even Houdini) who are prominent skeptics, so I thought they were generally sympathetic. I didn't realize that skeptical magicians had to walk on eggshells with the magic community. In fact, I distinctly recall that Randi revealed several of Uri Geller's tricks (see here). However, I think this falls under the category of secrets which cause measurable harm. Uri Geller convinced many people, even experts, to put money in his pockets, and write books supporting him. Still, I wonder if Randi's actions caused any backlash among magicians. I would prefer to respect the wishes of the magic community, but what if it becomes an obstacle to the goals of skepticism? Revealing basic magic tricks may hurt the reputation of skepticism among magicians, but doesn't it also advance the cause of critical thinking? D. J. Grothe claims that it does not. This is a very good point. I think it can be extended into an even deeper principle of skepticism. You just can't keep track of all the different ways that the human mind can be fooled. If you think that you can, you risk being unpleasantly surprised. In the Dots Game, we start by drawing a grid of dots. Two players take turns drawing lines between adjacent dots. Whenever a player completes the forth side of a box, they get a point and an extra turn. You can play the Dots Game here. I have a puzzle (of my own creation) which is inspired by the Dots game. To explain the puzzle, let me define some new terms. A box is complete if all four of its sides have been drawn. A box is open if exactly three of its sides have been drawn. A grid of dots is saturated if it contains no open boxes or complete boxes, and if it is impossible to add any new lines without creating an open box. In other words, a grid is saturated if it is impossible to make a move without giving your opponent an opportunity to score. The goal of this puzzle is to find the least number of lines necessary to saturate a 5 by 5 grid of dots. And if you're up for the challenge, try a 6 by 6 grid, and then a 7 by 7 grid. I feel moved to make further comments about politics. I mean, what kind of country is it where the president can say things like that? It's the kind of country where the people in it agree that atheists should not be considered citizens. That's just sad. I'm mindful in a free society that people can worship if they want to or not. You're equally an American if you choose to worship an almighty and if you choose not to. We know that men and women can be good without faith. We know that. I don't mean to assert equivalency between Bush and Obama. I merely mean to demonstrate that context is important too, that words alone aren't enough. I think my comment on the Friendly Atheist is a pretty good summary of what I think. The ad makes a great point, though I’m not sure that people will quite get it. 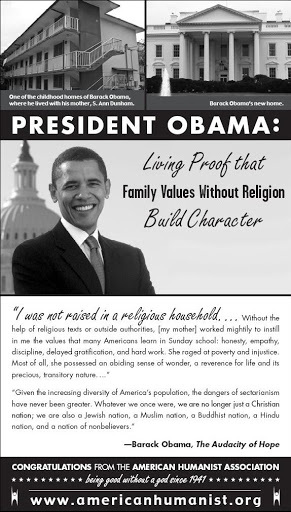 The ad does not say that Obama is non-religious (something I consider to be baseless speculation). What the ad does claim, is that he was brought up in a non-religious household. AFAIK, this is factually correct. And he turned out fine. Better than fine! Perhaps it is a good time to rethink attitudes towards converts. I wonder how religious people would react to the ad. I imagine that they'd first be somewhat bewildered. And then what? Having a blog makes me feel obligated sometimes to comment about current events. I sort of prefer to say things that are neither here nor there, but I suppose that reality is worth paying attention to. So... I think I'd like to echo the sentiment from this comic: "America is okay I guess sometimes". That is a message that I could maybe get behind, if it doesn't require any commitment. Happy MLK day, and then tomorrow, happy Inauguration Day. Also try to be happy the day after that, but don't force it. When I was young, I was once taught that God is Love. Period. I say "once" because even as a young child, it's easy to see that lots of different people have very different emphases in their religion. Some people will tell you that the central message in Christianity is the golden rule, others will tell you that it's forgiveness. Some tell you that Christianity emphasizes faith, others tell you that it emphasizes good works. Some tell you that God is Love, others will tell you that God is the Infinite. Were I still Christian, I would have picked one interpretation I liked best, and made it my own. Now, as an outsider, I have little business picking one interpretation over another. And yet, I must admit that I rather like the expression "God is Love", though for very different reasons than a Christian would. I like it because it can be subverted into something I myself believe. God is like love. Like love, God exists only in the mind. Yes, that's right. I, an atheist, said God exists. I declare this to be logically consistent. Are we still all on the same page? The human mind is perhaps the most powerful position God could be in. From the mind, God can influence entire cultures and civilizations. If God existed in the sky, he could maybe just control the weather. The downside of being only in the human mind is that if the human race dies out, God dies with us. To the theist, I might sound really cynical, but that is not my intention. The same is true of love, after all. All love comes to an end. But here is an important difference. Even though we know that all love comes to an end, we still seek it. There is no cosmic energy field which we call "love", but that's okay. We don't need the metaphysical realm to validate our emotions. But God is different. From what I can tell, people only seek God because they believe God actually exists in the metaphysical realm, outside of our minds. There are few people who seek God without seeking belief in God. That is, few people want religious experience without also wanting to believe that it was caused by a higher power. So I ask, if we need a lie for religious experience to be worthwhile, is it really worthwhile at all? Certainly not for everyone. One recent meta-analysis claimed to have found that homeopathy worked better than a placebo in general, but that it didn’t work better than placebo for any specific condition. I’m still trying to wrap my brain around that. That’s like saying broccoli is good for all people but it isn’t good for men or women or children. Other meta-analyses have been negative, especially the ones that looked at only the higher quality studies. A recent editorial in the British medical journal Lancet proclaimed “The end of homeopathy." But wait, the average for homeopathy is much higher! Why? It's because when we tested scientific medicine, we tested it on 100 people with the common cold, and 900 people with cancer. When we homeopathy, we tested it on 900 people with the common cold, and 100 people with cancer. Homeopathy did better than scientific medicine because scientific medicine was mostly tested on harder-to-cure conditions, like cancer, while homeopathy was mostly tested on the easy-to-cure stuff like the common cold. Should we go by the average, or by the results for the individual conditions? Easy. We go by the results for individual conditions. The overall average can be skewed, because, apparently, homeopathy is tested much more often on the types of diseases that are more likely to cure themselves. This might not be the answer to Harriet Hall's question, but it's a possible answer. Or perhaps she's just referring to a clearly flawed lie made by a homeopath. Frankly, either way, it doesn't speak too well of homeopathy. The first person to send me a solution was Eduard Baumann. Congrats! This puzzle was inspired by very similar puzzles which appeared in 100 Perceptual Puzzles, a book I was given a long time ago. Stay tuned for more puzzles! Some months ago, I was watching a play. It was one of those plays that consisted of lots of little skits, some of which make you laugh and others which make you cry. One of the skits was about a woman who was attached to her old table. Her husband wanted to replace it because it was old and falling apart. She was very unhappy about this because she had an emotional attachment to the table. Soon it was revealed that she was sitting at that table when she said her last goodbyes to her son before he died in the army. Ah yes, the conflict between emotion and reason. I've read that this is considered to be a kind of superstitious thinking. Even though there is nothing really special about that table, the woman treats it as if it were special because of the experiences she associates it with. Similarly, given an heirloom necklace, most people would value it more highly than any other identical necklace. Similarly, most people would feel uncomfortable about wearing a clean jacket if told that it used to belong to a serial killer. Ignoring the possibility of germs, I think it's rather clear that this is an irrational emotion. There's nothing really special about that table. It's just an inanimate object, and there is no substantial difference between it and any other table. I can't think of any survival advantage that this emotion could possibly confer. If we wanted to find the evolutionary explanation for this emotion, we would at some point have to talk about how natural selection is not perfect. But just because an emotion is irrational doesn't mean we should ignore it! After all, the reason we'd like a new table is so that we may sit and eat more comfortably. The reason we'd like to keep the old table is that it also gives us a different sort of comfort, no matter how irrational that comfort may be. If comfort is a worthy goal, it is not really irrational to go along with our emotions. Therefore, upon some thought, the woman isn't really doing anything irrational in trying to keep the table. It's not something I would do myself, but not everyone needs to act exactly like me. Now the truly irrational response would be to declare that the table really is special because its quantum state has been entangled with the dead son in such a way that it allows you contact him if you just focus your chi. Is my writing unclear? Ask a question! Have further commentary on my writings? Discuss! Do you disagree with me? That's good! Tell us about it! Off-topic comments and simple chatting are also welcome, but don't push it too far. That said, certain kinds of comments are unappreciated, and may be deleted at my own discretion. This includes comments that even appear to be spam or sockpuppetry, and anything that I judge to be plain incomprehensible. Again, mainly for my own benefit. Anyways, I declare this an open thread! Talk about anything you like. Ask me an uncomfortable question (I might not answer). Plug your blog. Do whatever. The trouble with space, among other things, is that there's no gravity. * Weightlessness is known to cause a variety of health effects, the most obvious being muscle atrophy. So how can we create an artificial gravity? There aren't really any other forces which behave quite like gravity, which always has a strength proportional to your mass. But wait, there's the centrifugal force! If you're on a large rotating spaceship, the centrifugal force is what flings you away from the center of rotation. *Technically, there is still gravity if you're in orbit, but you can't feel it because an orbit is basically a free-fall trajectory. At this point, I am obligated to defend my use of "centrifugal force". Some overzealous science teachers have insisted that there is no such thing as the "centrifugal force"; there is only the "centrifugal effects" and "centripetal acceleration". Take it from me, that is baloney. The centrifugal force is what we call a "fictitious force", a force that depends on our reference frame. But "fictitious" is a bit of a misnomer. Fictitious forces have effects that are equally real as any other force. It's also worth noting that under Einstein's General Relativity, gravity is also essentially a fictitious force. Gravity is still real, is it not? We're all physicists here, not solipsists! This is Space Station V, as seen in 2001: A Space Odyssey. It is a fictional example of a spaceship which harnesses the centrifugal force to create artificial gravity. No real examples exist, not yet. On the Space Station V, there are two independently rotating wheels. Unless any rocket fuel is expended, angular momentum (which is a measure of rotation) is a conserved quantity. Therefore, to preserve fuel, the spaceship would have an overall angular momentum of zero. Therefore, the space station is built so that the two wheels rotate in opposite directions, canceling each other's angular momentum. To consider the physics of the spaceship, let us consider just one of the wheels, and consider a rotating reference frame. It is important to remember that a rotating reference frame is not an inertial reference frame. That means that Newton's Laws do not apply! An object at rest does not necessarily remain at rest. Not every force is necessarily accompanied by an equal and opposite force. How can we even make sense of the physics of our rotating reference frame? It turns out that we can make sense of it rather easily. We simply need to assume that a new force, the centrifugal force, is acting on all objects. The centrifugal force pushes all objects outwards, away from the center of rotation. This situation should make sense in both the rotating reference frame and the stationary reference frame. Rotating reference frame: The centrifugal force pushes astronauts outwards, but the floor of the spaceship keeps him from being flung away. Stationary reference frame: The astronaut is circling around inside the rotating spaceship. He would continue flying in a straight line away from the spaceship, except the floor is stopping him. Let's consider another thought experiment. Let's say the astronaut is not inside the spaceship, but just outside of it, stationary. Let's look at what's happening in the two frames. Remember, both frames should make sense. Stationary reference frame: The spaceship is rotating, but the astronaut is not rotating with it. No forces are acting on him, so he remains stationary just outside the spaceship. Rotating reference frame: The astronaut is circling the spaceship. The centrifugal force is pushing him outwards, and yet, he remains in the circular path. How? The answer is that there are not one but two fictitious forces associated with a rotating reference frame. We have the centrifugal force, which pushes the astronaut outwards, and the Coriolis force, which pushes the astronaut inwards. You can all breathe a sigh of relief--we haven't broken physics after all. The Coriolis force works on all objects which appear to be moving in the rotating reference frame. That's why we didn't have to include it when we were talking about the astronaut inside the spaceship--he was stationary with respect to the rotating spaceship. The force does not always pull you inwards, but it is always perpendicular to the object's motion. Let's say you are inside the spaceship, facing the direction of rotation. If you run forward, you will feel heavier. If you run backwards, you will feel lighter. And this is a little harder to imagine: if you jump up, the Coriolis force pushes you slightly forward, and when you fall back down the Coriolis force pushes you slightly backwards. 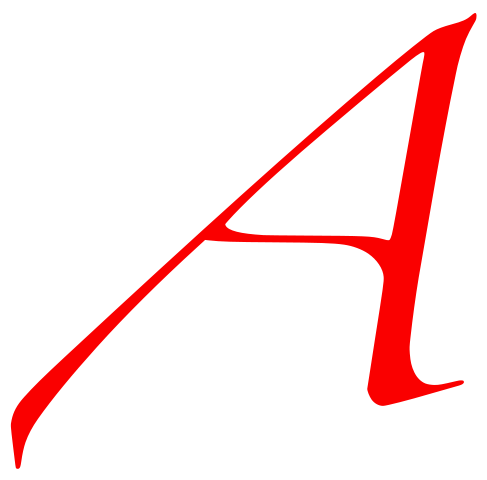 In atheist circles, it is dismayingly common for atheists to say: "Fundamentalists are, arguably, more true to religion than the moderates. Fundamentalists take the entire Bible seriously. Moderates, on the other hand just cherry-pick the parts of the Bible they like, and call the rest metaphor. But if you allow part of the Bible a metaphor, on what basis can you discern the literal from the metaphorical?" First of all, there are some parts of the Bible that are quite obviously meant to be metaphorical: Jesus' parables, or the phrase "lamb of God". And there are some parts that are quite obviously meant to be historical: all those boring genealogies (though I would not trust their accuracy). I say it's obvious, but on what basis? It's on the basis that I can read. On the basis that I'm not stupid. The rest of the Bible is less obvious, but that doesn't mean it's impossible to determine the genre of specific parts. For one thing, the Bible is not the only religious authority. There is tradition. The Church (especially for Catholics). Theology and Natural Theology. Or, if you like, you can ask God. No, I don't consider these to be legitimate authorities on anything I'd call "truth", but their authority is at least as legitimate as the Bible's. In what sense is it more "true to religion" to take the Bible's literal word as authority, as opposed to taking the teachings of the Church as authority? If you want a more legitimate authority, you might try the study of history. I'm not much of a history person, but I believe in historical evidence. Just because it's one of the humanities doesn't mean you can't determine historical facts with a reasonable amount of certainty. When we disagree with historical revisionists like the Holocaust deniers and Afrocentrists, it's not because we simply dislike their political motives, but because they are actually incorrect, as determined by historical evidence. Historical evidence can be used to determine the context of the Bible. Who wrote it, when, with what purpose, within what culture, translated by whom, etc. From this, we might determine the relative reliability and authority of different parts of the Bible. I don't know any details, because I find it all rather boring, but at least I know that the field exists. The atheists in the audience might ask, "Doesn't the fact that the Bible was written by flawed humans contradict the idea that it is the word of God?" Not really. It can't, because "word of God" is one of those vague waffly terms whose meaning is widely disagreed upon. In any case, it is far more obvious that the Bible has a historical context than it is that "Word of God" means every word should be taken literally. My point is that it is possible to discern the good from the bad in the Bible, and there's no reason to take an "all or nothing" attitude. We ought to acknowledge the possibility, so we can move onto the real problems. The real problem: historical study of the Bible has been unduly biased. If anyone thinks the Bible is reliable evidence of physics-defying miracles, that's an obvious sign of bias. Second, normal everyday Christians are ignorant of any sort of Biblical scholarship. They simply assume that history backs up whatever they already believe. Or worse, they find a few biased experts who agree with them. Third, those who take the Bible metaphorically usually assume that it is morally instructive (or instructive in some other way). Perhaps this is sometimes true, but one needs an outside source of morality to determine which parts are good and which aren't. More generally, I dislike some atheists' attitudes towards "moderate" religion. They seem to think that moderates somehow reduce to, or are a lesser form of fundamentalists. All this despite the fact that most of us would obviously prefer it if all religion were more "moderate". Moderate religion is often considered to be a "shifted goalpost" from fundamentalism. But goalpost shifting is only wrong when used for convenience within a debate; here the shift is the result of a long historical process. Besides, it's the fundamentalist movement that is relatively modern. And regardless of whether moderate religion reduces to fundamentalism, the argument is about as compelling as an apologist arguing that atheism is a lesser form of nihilism. That is, you're trying to be charitable, but you actually end up making a straw man. I am in favor of directing much criticism towards fundamentalists and evangelicals, as well as making people aware of how large, powerful, and dangerous the fundamentalist faction is. But if your target is moderate religion, please argue against people's actual beliefs, not against the fundamentalist beliefs that you think are so much "better". When talking to other people who are into skepticism, I often think, "Why don't I have any skeptical stories?" I have hardly any personal anecdotes relating to skepticism. I guess skepticism has never really affected my personal life in any deep way. For instance, I don't have any acquaintances who are 9/11 troofers or relations who are into feng shui or anything like that. Well, I probably know lots of people who believe weird nonsense, but I just don't go out of my way to look out for that kind of thing, or do anything about it if I see it. Come to think of it, my mother has a thick book of traditional and herbal medicine that I'm not sure she's ever looked at. I think I told her that whatever good there might have been inside, it was mixed in with plenty of bunk. And that was that. Also, she's always telling me to take vitamin supplements and I'm always telling her that I think they're unnecessary. If I were a different person, might I have made a skeptical story out of it? Other things that have never happened to me: I know of no relative who sought alternative medicine in the face of grave illness. I have never argued with the various hellfire preachers, LaRouchians, or other strange types that appear on campus (though I've encountered a few cranks online). My high school never taught creationism or even avoided evolution. Maybe this is why I'm so apathetic? It's sort of sad, in an ironic, ambiguous way (this is our favorite kind of sad). Is it even supposed to be sad? I don't need to have skeptical stories, after all. It's as if I were musing about how I've never personally seen much poverty. I guess that would actually be a good thing. Or maybe it's my own fault for not looking out for it. What do you think? There's one little exception, of course. I grew up Catholic, but now I'm not. My deconversion experience was fairly tame and undramatic, but it's still an anecdote I could tell. And though I've previously stated that skepticism and atheism are two different things, I would still call deconversion a quasi-skeptical story. A skeptical story that has personally affected me. If there are a lot of skeptics in the same boat as me (and I suspect there are) this could go a long way in explaining why so many outspoken skeptics are atheists and vice versa. I once knew a guy who repeatedly told me I need to be more open-minded. He seemed to view it as if we were in a cheesy movie, where I was the stereotypical nerd, and he was the "fun" counterpart. It was his job to eventually reform me into a less nerdy guy. You know, one who would do alcohol and pot. I have deep reserves of unspoken contempt for drugs, but I was open-minded enough that I was polite in my refusal. As a skeptic, I am perfectly aware of one of the most common criticisms of skepticism: that it is close-minded. Skeptics are unwilling to accept new ideas; they are too quick to dismiss. They seem so sure of themselves in their scientific worldview. In the interest of being open-minded to all possibilities, let us first consider this one: perhaps open-mindedness should not be a virtue at all. I, for one, am leery of all so-called "virtues", especially ones that are understood differently by different people. How can we unambiguously declare "open-mindedness" to be "good" without reference to any particular definition of "open-minded"? For example, if by "open-mindedness", we mean becoming the stereotypical reformed nerd in a stoner film, then it is a virtue I want no part of. However, if by "open-mindedness" we mean tolerance of other people's lifestyles, then I'm generally in favor of it. Can't convince a skeptic? Try evidence. We're too quick to dismiss woo? Probably because the same pattern of mistakes is easily recognizable every time. Skeptics are dogmatic? Well sorry for having an opinion. Next time, I will close my mind to anything but the center of debate. Skeptics are disrespectful? Sometimes true, but it's nothing a few "yoursocloseminded!!! "s won't cure. Skeptics think only science can explain things? I have many reasons for thinking so, but maybe I will forget about them if I am open-minded enough. Skeptics will never convince anyone, so why do they even try? Perhaps it's because we don't project our own close-mindedness onto everyone around us. Skeptics never change their mind? Probably we only do it when you aren't looking. In the interest of coherence, from this point on I will take "open-mindedness" to mean the willingness to change one's mind. I agree that this is a virtue. But when it comes to changing one's mind, I take it very seriously. After all, the virtue in changing mind is that we get closer to truth or wisdom. If we just change our minds at the drop of a hat, we're just as likely to get further as we are to get closer. My view is this: For every good idea out there, there are several bad ideas. To find a good idea is not a matter of picking up a large pile, but a matter of carefully sorting it all out and discarding the bad ideas. This process is highly nontrivial, error-prone, and almost hopelessly swamped by the shear number of ideas out there. We need to be able to tell the difference quickly and efficiently, even if that means being slightly on the dismissive side. To use a cliche, when we have solved all the mysteries of real phenomena, then we will worry about longshot paranormal theories. This way, I have a much greater chance of ever changing my mind. And I have changed my mind many times, mostly in the lateral directions. Michael Shermer convinced me to care more about why people believe weird things. Bob Altemeyer convinced me of the importance of the authoritarian personality in today's politics. Plantinga convinced me that "sophisticated" apologetics really is junk after all. Sciam convinced me that the Many Worlds Interpretation is legitimate. BASS convinced me that organizations are worthwhile after all. My history professor convinced me that there is much more to religion than just belief. Greta Christina--well she convinced me of a whole lot of things. This is just to name a few examples that occurred in the last year (and a few of which I blogged about). What more can I say? If this is close-mindedness, it has worked out quite well for me, hasn't it?